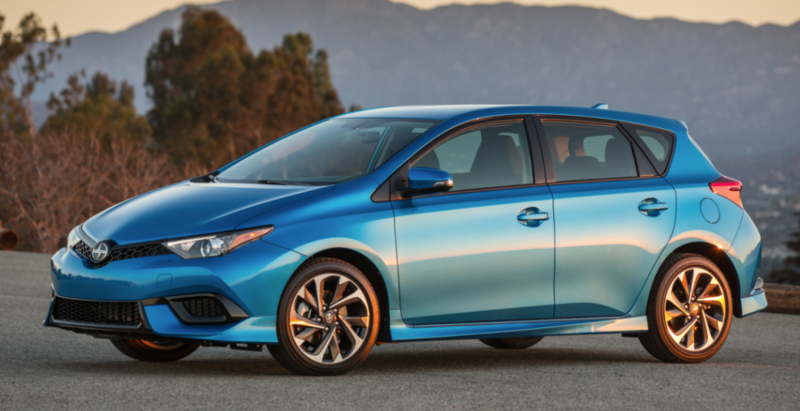 Scion adds the iM compact hatchback to its lineup for 2016. It’s a stylish entry with one highly contented trim level and an “out the door” price of less than $20,000. This fall, there will be some prominent comings and goings in Scion showrooms. Coming will be a new iA subcompact sedan (the first sedan in the company’s history) along with a compact 4-door hatchback called the iM (the subject of this report); going will be the tiny iQ and the “staple” xB compact wagon. The only carryovers are thus the front-wheel-drive tC and rear-wheel-drive FR-S sport coupes. As such, the focus of the brand is shifting somewhat; away from the unique if limited-appeal cars that Scion has sold in the past, and toward more mainstream entries that should attract more interest – and more buyers. To that end, expectations are that the switch from low-volume oddities to mass-market commodities will boost overall sales significantly. Whereas the iQ and xB have combined for only about 25,000 annual units, the iA is expected to account for about 40,000, with the iM adding another 20,000 or so. An aggressive look belies the fact that the iM is aimed more at economy and a high features-per-dollar ratio than a true sporting demeanor. Yet in each of their respective classes, Scion is backing the underdog. The iA is a sedan in a segment dominated by hatchbacks, and the iM is a hatchback in a segment dominated by sedans. In some ways, however, that strategy helps prevent cannibalizing sales from parent-company Toyota – with which all Scion vehicles share a showroom – as the subcompact Toyota Yaris comes only in hatchback form (with 2 or 4 doors), while the compact Corolla is offered only as a sedan. As with other Scion products, the iM adheres to a one-trim-level/no-options policy, with the only choices being manual or automatic transmission and paint color. Also in place is the Scion no-haggle pricing policy, which means the intent, at least, is that buyers spend a minimal amount of time in the purchasing process. And what is the “no-haggle” price? With manual transmission, it’s $19,255, and with CVT automatic it’s $19,995. In large part due to the no-options policy (though there will be dealer-installed navigation system and dress-up items available), the iM comes with a fairly heavy load of standard equipment. Unexpected for the class are automatic climate control, cruise control, auto on/off headlights, heated power-folding mirrors, remote keyless entry, rearview camera, 18-inch alloy wheels, a 4.2-inch multi-information display in the instrument cluster, a 7-inch dashboard touchscreen, Bluetooth audio and phone, voice recognition, text-message feature, Aha app, and an audio system with automatic sound leveling (based on vehicle speed). While Scion seems to be pushing the 4-door, front-wheel-drive iM as a sporty compact (the press kit is riddled with phrases such as “Sports-car inspired,” “Sporty, dynamic performance,” “Wide 225 [series] tires,” and “Ripped bodylines”), the available powertrains don’t really reflect that. Only one engine is offered – a 137-horsepower 1.8-liter four – and it can be mated to a choice of a 6-speed manual transmission with “hill-holder” feature or a CVT automatic with Sport mode. (To put that into perspective, the competing Ford Focus comes standard with a 160-horsepower 2.0-liter four and offers a turbo version with 252 horsepower.) The CVT is the thriftier of the two, with EPA ratings of 28 city/37 highway vs. the manual’s 27/36. Most of today’s compacts offer a decent amount of interior room for four full-size adults, and the iM is no exception. Really tall front-seaters can dial in plenty of headroom thanks to the standard height-adjustable seats, and they’ll likely find legroom adequate as well. However, legroom behind them shrinks enough to limit back-seaters to about 5’9; otherwise, headroom and legroom would be sufficient for 6-footers to sit in tandem. A slash of white trim helps break up what is otherwise a rather dark, monotone interior. 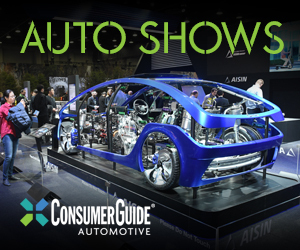 There is nothing subdued about its content, however, as a host of features are standard — and there are no options save for dealer-installed navigation system and some dress-up items. The interior boasts plenty of padded surfaces, including the dash, door tops, and armrests, and the basic-black color scheme is broken up with a swatch of white across the bottom of the dash along with a few silver accents. There’s also a leather-covered steering wheel (a nice touch at the price) and the seats are upholstered in dual-patterned cloth. Visibility is quite good to the front and sides, less so to the rear corners due to rather thick roof pillars. Oddly — at least on the pre-production cars we drove — the sun visor didn’t extend when swung to the side, thus leaving a big gap at the back half of the window for sunlight to sneak through. 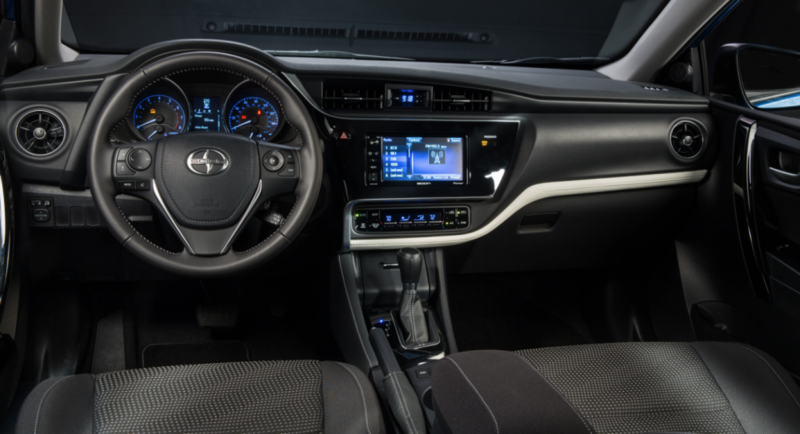 The audio system has only one knob – for on/off and volume – the other functions being controlled through the touchscreen. Below the screen are the climate controls, which consist mostly of “flippers” to adjust temperature, fan speed, and mode. All controls are mounted fairly high and within easy reach. Interior storage consists of a moderate-size glovebox, small 2-tiered console box, a covered forward console bin with Aux/USB/12-volt plugs, two cupholders, and small map pockets in the doors. In back, the cargo area is wide at the rear but has about a 4-inch liftover from the top of the opening. 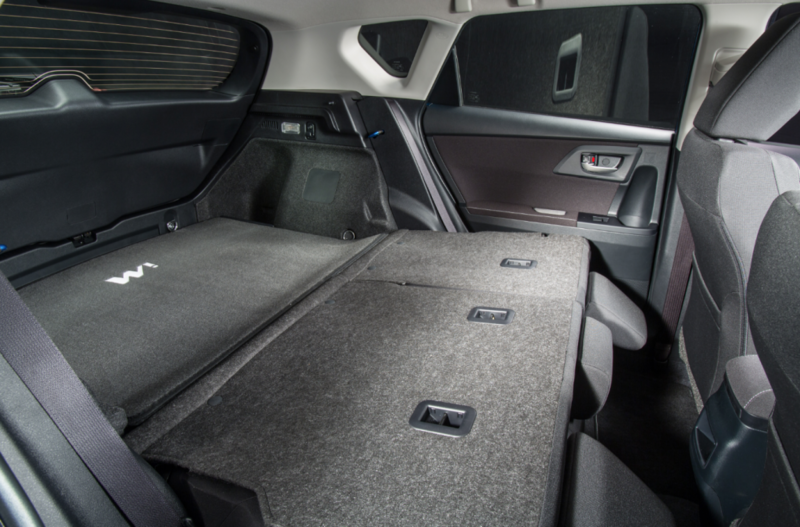 There’s quite a bit of storage for flat items under the floor, and the rear seat backs fold nearly flat and level to expand the space. The iM’s cargo area is fairly large and quite versatile, with folded rear seat backs that lie nearly flat and level with the floor in back, which has some “hidden” storage beneath it. We didn’t get an opportunity to test a manual-transmission model – which Scion says will represent only about 10 percent of sales – but we did spend a fair amount of time in one with the CVT automatic. While acceleration is plenty good enough to keep up with traffic, flooring the throttle from a stop doesn’t seem to bring much quicker movement off the line than a quarter-throttle stab, and there’s an unusually long wait for power to build. Once under way, however, hitting the gas results in fairly quick kickdowns for added passing power. More in line with the iM’s sporting intent is handling. The car cuts into corners more sharply than most in this class, and it carves through fast ones with modest body lean. The ride is firmer than the class norm but is never uncomfortable, with the net effect being that the iM feels sure-footed and confident on the road. While the iM’s somewhat pedestrian powertrain seems a bit at odds with the car’s sporty handling and aggressive styling, perhaps that’s an effect of its design lineage and place in the Scion lineup. Although it’s new to the states, it isn’t really new, as it’s nearly identical to a hatchback version of the Toyota Corolla that’s sold in Europe as the Auris. Furthermore, Scion doesn’t want it to steal sales from the existing tC, which carries a stronger engine and is aimed more at the “go fast” crowd. 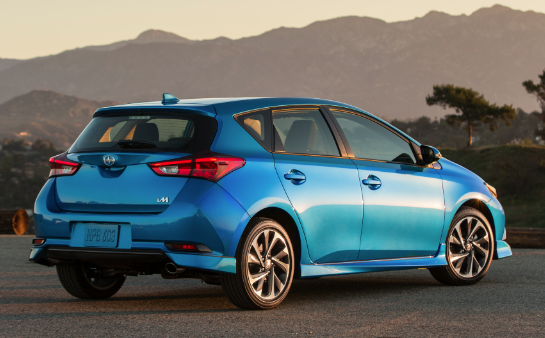 That leaves the iM as an upscale compact hatchback with an enviable features-per-dollar equation. As such, it’s a strong entry in a high-volume class, a combination that should make it an unusually popular vehicle in Scion’s revitalized lineup. Written by: Rick Cotta on July 6, 2015.on March 26, 2018.